The Edinburgh writer David Dunbar owned tenements on either side of this close in 1773 hence its nomenclature. Mrs. Love's oyster cellar was situated nearby, and in 1786 Robert Burns is known to have visited to enjoy the wine, women and song! 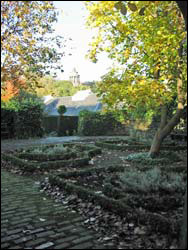 Hidden within the close today is a garden laid out in the character of the seventeenth century, donated to the City of Edinburgh by the Mushroom Trust in 1978.